Every year for the last six years, my dad, brother, and a friend from grade school have been making an annual trip to a White Sox game at some point during the year. This started with my bachelor party six years ago and continues to be a tradition. Every year we pick up wings and tailgate before heading in to US Cellular Field. 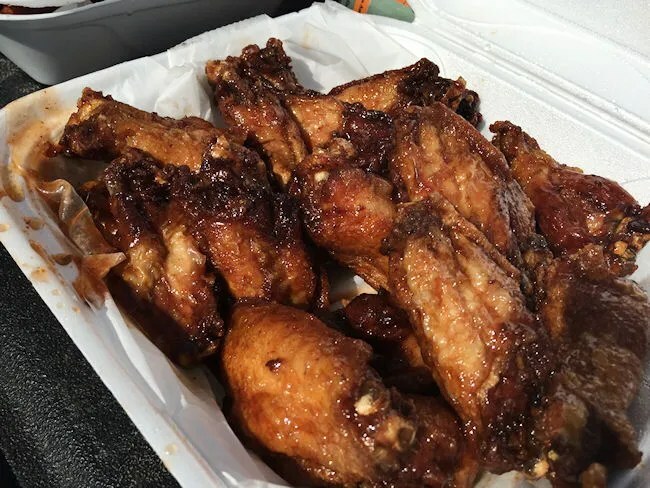 The first three years, we had the best wings any of us had ever had from Wings Around The World on 75th Street. Two years ago, that placed closed and we had to find replacements. Neither of them really lived up to what we were used to, so again this year, I started looking for a new wing place. Out of sheer desperation, I typed in “Wings Around The World” and I actually got a hit that looked promising. There looked to be a new Wings Around the World just down the street from the old one….and the menu looked really close to the same. 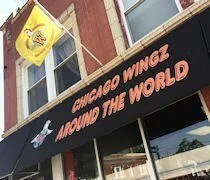 Chicago Wingz Around The World is on East 75th Street between Rhodes and St. Lawrence in Chicago’s Greater Grand Crossing neighborhood. The building sits right on the corner of 75th and St. Lawrence on the south side of the road. Parking for the restaurant is all street parking. I had my brother pull in to the bus stop and let us out. I figured we weren’t going to be too long and as long as he was there, they weren’t going to tow him. My buddy and I were actually met at the door by the owner for some reason. He shook our hands and thanked us for stopping in. He must have known we had the huge order sitting on the counter waiting to be picked up. In the past, we’ve always ordered 75 wings with a number of different sauces. This new restaurants limits the number of sauces and you have to order them in multiples of 20. We ended up ordering 100 wings this time because 75 wasn’t an option and none of us just thought to order 50 then an extra 20. 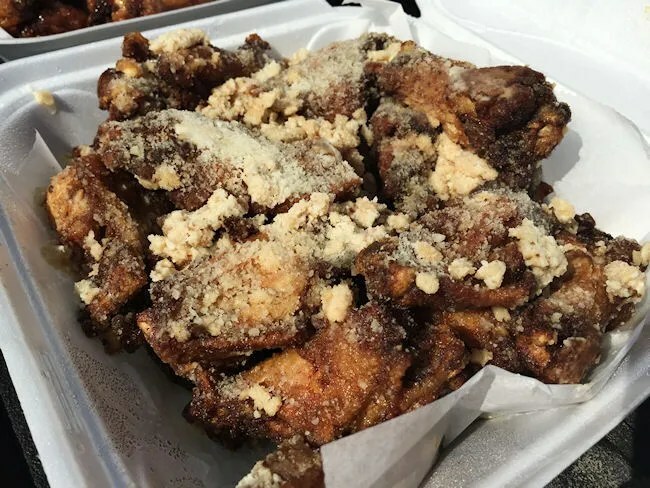 We placed our order for 100 wings with 40 garlic-Parmesan because that’s the one everyone likes. The other flavors we got were Sweet-n-Sour, Bangin’ Buffalo, and Honey Mustard. The cost for the 100 wings was just under $80. They were all boxed up and ready to go when we got there, so it only took us a few minutes to grab the wings and head on over to The Cell. We seriously couldn’t wait to get parked and get the wings out. We got to the ballpark a few minutes before they opened the parking lots, so we had to wait more agonizing minutes before we could eat. Once they finally did, we got parked, grabbed a beer, and dove in to the wings. I would have been completely happy eating nothing but the Garlic-Parmesan. Those wings are SO. DAMN. GOOD. The wings are meaty, juicy, and covered in the garlic and Parmesan coating. Of the 40, I probably ate at least 20 of them. My dad had a few and a few were boxed up for my sister-in-law. Given the chance, I would have polished off all 40 of them. The Bangin’ Buffalo was my second favorite. These were much more traditional Buffalo wings. They were soaked in a hot sauce that was a little past the medium side of hot, but they were still nice and crunchy and, of course, super juicy. I wasn’t a huge fan of the Sweet ‘n Sour, so I stayed away from those after trying one. My brother and buddy seemed to like them though and the two of them made the biggest dent in that pile. The Honey-Mustard wasn’t bad, but again, I tended to shy away from those. I just wanted the dang Garlic-Parmesan. As we were picking up the wings, my buddy started chatting up the owner. 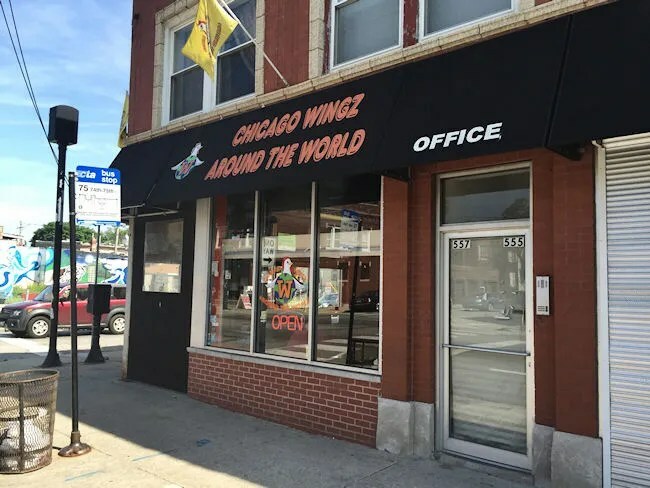 It turns out they are not the same as the Wings Around the World from the down the street, but they use a lot of the same recipes. The wings were just as good as we remember and this restaurant is a little bit better than the one down the street was. 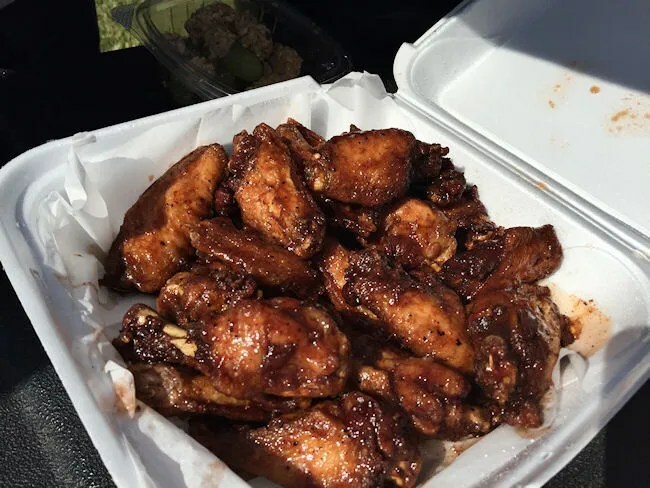 The big difference is that they have seating and a much bigger menu, but the only thing we really cared about was the wings….and DAMN are they good.